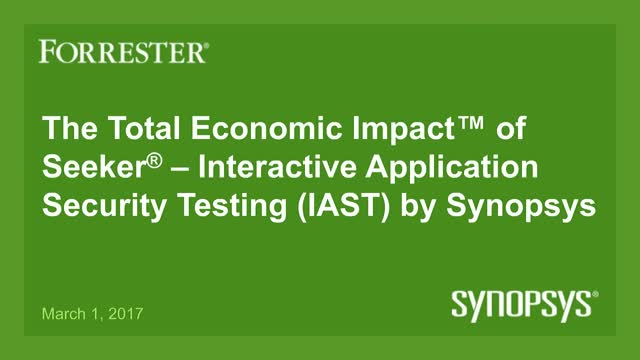 Implementing Seeker, Interactive Application Security Testing by Synopsys, in your Agile development environment not only reduces time and cost to remediate security vulnerabilities, but also reduces risk of a data breach. To quantify these benefits, Synopsys commissioned Forrester Consulting to conduct an in-depth customer case study to examine the potential ROI an organization may realize from deploying Seeker. Join guest speaker Liz Witherspoon, Principal Consultant at Forrester Research, and Nadav Kotlarsky, Sr. Product Manager, as they explore an in-depth customer case study quantifying the potential ROI of deploying Seeker. Just like most software assets contain open source, modern software applications commonly link to external web services via APIs. By using web services, developers may be inadvertently signing their companies up to terms of service or using a web service without a suitable agreement. And using these services can expose a company to security, data privacy, and operational risks that could disrupt or severely affect the business. As part of the tech M&A due diligence process, you should be aware of these web services-related risks so that you can make informed decisions about deal valuation and remediation. Don’t miss this informative webinar. Register today. As the cyber threat landscape evolves and external dependencies grow more complex, managing risks to enterprise and connected embedded systems requires more than reactive measures. Many organizations proactively reduce attack surfaces in their cyber supply chain and assets targeted for exploitation. IT asset management should leverage automated means to detect weaknesses and vulnerabilities in software. Addressing cyber supply chain dependencies enables the hardening of attack surfaces by comprehensively identifying exploit targets, understanding how assets are attacked, and providing responsive mitigation. Automation tools and services, testing and certification programs now provide means to reduce risk attributable to exploitable software. This presentation addresses means of using information to prioritize mitigation efforts focused on reducing exploitable attack vectors; enabling organizations to proactively harden their attack surface and become more resilient in the face of growing threats and asymmetric attacks. Lt. Col. Joe Jarzombek (USAF, ret.) is Director, Government, Aerospace & Defense Programs at Synopsys. He previously served as Deputy Director, Information Assurance in the Office of the CIO Dept. of Defense. He later served as Director, Software and Supply Chain Assurance in the Dept. of Homeland Security. Today, Joe guides Synopsys’ global leadership to address needs of public sector, aerospace and defense communities. He participates in consortia, public-private collaboration and standards groups, and R&D projects to accelerate technology adoption. Joe has 30+ years in software security, safety and quality in embedded and networked systems and enterprise IT. Joe is a Certified Secure Software Lifecycle Professional (CSSLP) and project management professional with an MS in Computer Information Systems, a BA in Computer Science and a BBA in Data Processing and Analysis. Open source components form the foundation of modern applications, but ineffective open source risk management can lead to security breaches that negatively affect your business and damage your brand. The Open Source Security and Risk Analysis (OSSRA) report examines trends in open source usage and risk management practices based on the audits of more than 1,200 codebases. Listen in as we explore how the open source landscape has changed—and improved, in some cases—but more importantly, how development, security, and legal teams can improve their open source risk posture. In over 1,000 codebases audited in 2018, Black Duck Audits found that nearly every one contained open source components. Not only that, but a significant percentage of “proprietary code” overall was open source. Virtually every company building software now depends on open source, and with great reason. However, left unmanaged, open source can lead to license compliance issues plus security and code quality risks. Whether you’re on the buy side or sell side, these risks could negatively affect valuation in an M&A transaction. Don’t miss this informational webinar – register today. The promise of containers and cloud-based microservices is fast time to market for applications. But there are security requirements that, if not handled properly, can slow down the pipeline and lengthen time to market. Automation is critical to a CI/CD pipeline, and it is also critical to secure deployment of containers. Join Synopsys and NeuVector to explore the key automation integration points in the pipeline and learn how to build security into your process, culture, and toolchain, from build to ship to run. Open source usage has had a steady increase over the years and so has the Open Source content, which has seen exponential release. The strength of open source is attributed to the fact that there has been a growing adoption of Open source in enterprise application. The Product Team at Synopsys is excited to introduce the Polaris Software Integrity Platform™, which brings the power of Synopsys Software Integrity products and services together into an integrated solution that enables security and development teams to build secure, high-quality software faster. Polaris uses a SaaS delivery model and provides a centralized web-based user interface for Synopsys products and services—ensuring quick deployment and a unified user experience across Synopsys solutions. Polaris includes Code Sight™, our new IDE plugin that automatically and continuously analyzes code as it’s being written—allowing developers to focus on their tasks at hand without needing to initiate scans or leave the IDE for security information. Stories of women in the modern workforce continue to seize our attention, not least because of the dedicated champions who work tirelessly to empower women to speak out about what they need, what they want, and what talents they bring to the table. But the tech industry lags far behind the overall U.S. workforce when it comes to closing the gender gap. In a sector that employs fewer women in any position—even fewer in technical positions—and is fed by an educational system with a stubborn gender imbalance, what can we do to encourage more woman to work in tech? We can start by celebrating the women who are already here. In this panel, we invite some of the women of Synopsys to tell us about their experiences in the tech industry. We’ll discuss how they got started in tech and advice for other women who want to enter the field. Our panelists will dive into the unique challenges they’ve faced and how to balance priorities in a fast-paced, high-stress environment. And they’ll provide insight into what organizations are doing—and should be doing—to enrich their culture with employees that have a variety of experiences and perspectives. There is risk in any M&A transaction but having the right tech due diligence approach can help mitigate that risk. If software is a large part of the deal valuation, you need to understand any potential legal and security risks in the target’s codebase that could affect the value of the IP, and the remediation required to address those risks. Don’t miss this informational webinar. Register today! När fordon blir smartare blir även säkerheten inom bilindustrin allt viktigare. Bilar förvandlas till Wi-Fi-hotspots och innehåller många miljoner kodlinjer för autonom körning. Som ett resultat är fordonen mer sårbara än någonsin för buggar, hackare och dataintrång. Kärnan i morgondagens fordon är programvara med artificiell intelligens och kraftfulla kiselchips som alla arbetar tillsammans. Lär dig hur dessa tekniker kommer att förvandla den traditionella underleverantörskedjan från en mekanisk driven värld till en digital. OpenShift 4 represents the culmination of a number of new technologies. One key feature of this release is CRI-O, the new container runtime that is optimized for OpenShift. But a new runtime doesn’t have to be scary. Black Duck OpsSight for OpenShift still provides the same security intelligence and visibility into all the third-party open source software that composes your containers. As vehicles get smarter, security in the automotive industry is an increasing concern. Cars are being turned into Wi-Fi hotspots and contain many millions of lines of code for autonomous driving. As a result, they are more vulnerable than ever to bugs, hackers, and data theft. At the heart of the vehicles of tomorrow is software with artificial intelligence and powerful silicon chips all working together. Learn how these technologies will transform the traditional automotive supply chain from a mechanical-driven world to a digital one. The world of software development has firmly adopted open source development paradigms. Regardless of the type of application you’re developing, it’s safe to say that open source is a key part of your solution—whether you wanted it to be or not. Similarly, developers deal with security issues in their code throughout the development cycle, but most don’t think about how open source components affect the security of their end product. In this master class, we’ll look at how open source development works, how open source components are embedded in solutions, and how an open source vulnerability is both disclosed and patched. After all, while open source software is just as secure as its commercial cousins, the security disclosure processes for the two types of software is far from the same! Moving to cloud-native development is no less transformative than were moves from client/server to web, or from browsers to mobile devices. The software life cycle has changed, and along with it, the cadence of development and the tools on which that life cycle depends. The best security tools have required a lot of hand-holding to accomplish their thorough analyses. In this webinar, we’ll discuss recent advancements in best-of-breed security tools (such as composition analysis and vulnerability discovery) that allow organizations to scale their use to a portfolio of software without an army of staff. We’ll discuss how test orchestration and vulnerability management platforms allow CISOs to package these tools as “software security in a box” and deploy them seamlessly to brownfield development teams maintaining large business-critical software, as well as those tiger teams conducting digital transformation in a hybrid or multicloud world. Today’s vehicle is a connected, mobile computer, a situation that has introduced an issue the automotive industry has limited experience dealing with: cybersecurity risk. Automotive manufacturers have become as much software companies as they are transportation companies, facing all the challenges inherent to software security. - The automotive industry has insufficient cybersecurity resources and skills. - Some of those most knowledgeable about automotive cybersecurity feel powerless to voice their concerns. - Automotive cybersecurity testing may be occurring too late in the product development life cycle. We will also discuss how SAE International and Synopsys can help lead the industry in planning cybersecurity strategy and generating solutions using the data points collected in the survey. We all know that fixing defects early in the SDLC is the right approach to building secure software. Security needs to be in every part of the pipeline but it’s often hard to get everybody onboard with software security initiatives. Come join us on this webinar to explore how to build a culture of proactive secure programming in your technical organization and how to implement security as an enabler without disrupting the velocity of projects in modern development teams. See how Synopsys tools and services can allow you to build secure, reliable and quality software. The Polaris Software Integrity Platform™ brings the power of Synopsys Software Integrity products and services together into an integrated solution that enables security and development teams to build secure, high-quality, software faster. Polaris comes as a subscription entitlement with Coverity as well as Black Duck, Seeker and Managed Services. Polaris allows customers to start with a single SIG product subscription (e.g. Coverity) and seamlessly add other products as needed, by providing a unified user experience and deployment architecture. In this Partner focused webinar, Neal Goldman, Product Manager of Polaris, will provide an overview of the Polaris Platform and its unique value to our Partners as an Ecosystem Platform. Neal will discuss how Polaris provides a common integration framework for the SIG portfolio, allowing our Application Development, Cloud, Vulnerability Management, and Global System Integrator partners ease of integration into their products and processes. Neal will also discuss how our Partner’s existing integrations into SIG products will continue to be supported and how they will interact with the Polaris platform. Gain insights into important legal developments from two of the leading open source legal experts, Mark Radcliffe, Partner at DLA Piper and General Counsel for the Open Source Initiative and Tony Decicco, Shareholder, at GTC Law Group & Affiliates. Live attendees will earn CLE credit for this webinar. Don’t miss out – register today. CLE credit will be applied for in other states where DLA Piper has an office with the exception of Minnesota, North Carolina, Pennsylvania, and Puerto Rico. As organizations come to rely heavily on software to perform critical business functions and deliver customer value, cyberattacks have unfortunately become common. Web application attacks were responsible for 38% of data breaches in 2018. Securing these applications is critical to promote customer trust, protect business critical information and the company’s reputation. Fixing vulnerabilities before applications are deployed isn’t just smart, it saves downstream costs too. Modern web applications are increasingly reliant on frameworks that simplify the application code but can introduce their own vulnerabilities. In this webinar we discuss how the Coverity 2018.12 release enables organizations to build secure web applications faster. The latest release addresses three increasingly important needs for enterprise application security teams: scalability, broad language and framework support, and comprehensive vulnerability analysis. Building upon its historic advantages in deep, accurate code analysis, Coverity 2018.12 greatly expands upon its coverage of web languages and popular frameworks and makes it fast and easy to analyze applications. The result is applications that are inherently more secure before they are deployed into production. Build secure, high-quality software faster. Synopsys helps development teams build secure, high-quality software, minimizing risks while maximizing speed and productivity. With a combination of industry-leading tools, services, and expertise, only Synopsys helps organizations optimize security and quality in DevSecOps and throughout the software development life cycle.